Melting Into Taxims with Lynx - 3 SPOTS LEFT! Add depth to your performance by allowing yourself to be vulnerable and melt into a taxim. Taxsims are moments in music when a member of a band plays an improvised solo. Oftentimes these solos are melodic and lack rhythm. Thus the dancer has to improvise to a musician’s improvised music. ​Workshop includes tips on extension and posture to increase the illusion of flexibility as well as notes on improvising and choreographing taxims. Let's focus on technique break downs and strengthening exercises. We'll get into the nitty gritty with layering, level changes, travelling steps, flourishes, accents, nuances and expression. We will cover some Caribbean movement technique as well and show how it can be incorporated and used to help add strength, stamina, and range of movement to your technique. ​No choreography, just an in depth look at movement and mechanics and the musicality to make them shine. Improvisational techniques will be covered as well. Baladi Progression Technique and Choreography with Cassandra Fox - SOLD OUT! Slow, sensual, gooey, fluid, powerful, earthy, and feminine. What else do you need?! Improving Improvisation with Cassandra Fox - SOLD OUT! This workshop covers various exercises and techniques to help build confidence and skills for improvising. Improvising can be intimidating and we can find ourselves stressing about repeating the same movements and overthinking instead of enjoying the music and sincerely reacting to it. This workshop is designed to help get past these mental blocks and work through our concerns and generate that anxious energy into energy we can utilize in our dance. Stretch & Shimmy with Sa'diyya - SOLD OUT! 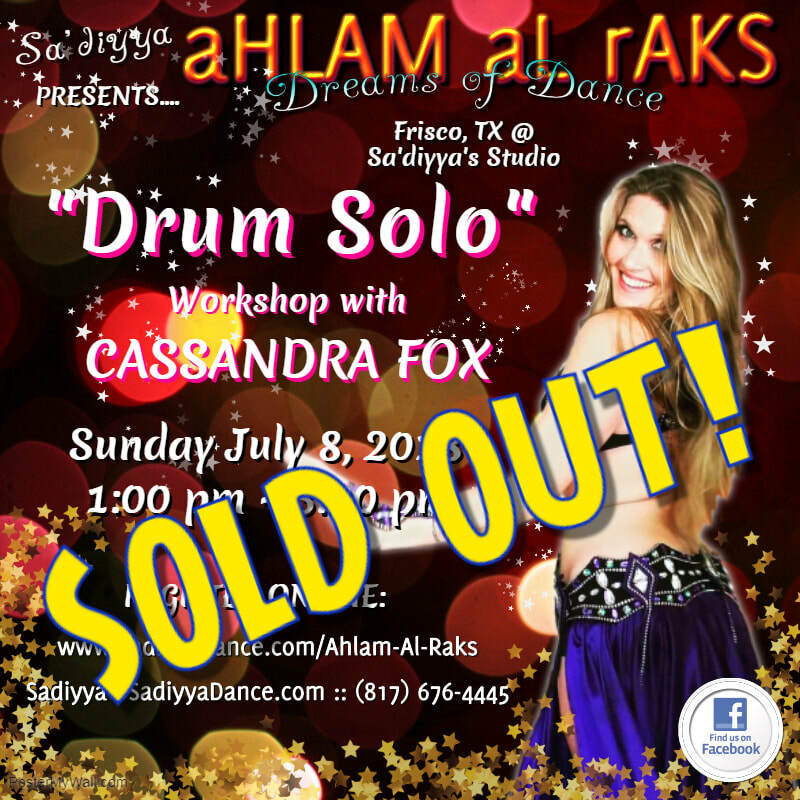 Drum Solo Technique and Choreography with Cassandra Fox - SOLD OUT! This workshop is an overview of strength in technique to help create fun and exciting drum solos. Special attention will be given to creating power and fluidity in movements while keeping them clean and sharp. Intro to Caribbean Fusion with Cassandra Fox - 1 SPOT LEFT! In this specialty workshop, you will learn about the music and movements of Caribbean dance (Dancehall, soca, reggae, reggaeton, etc.) and the technique behind the movements! We will specifically look at the music and movements which allow for a seamless fusion with Bellydance. Get ready to HAVE FUN & SWEAT!